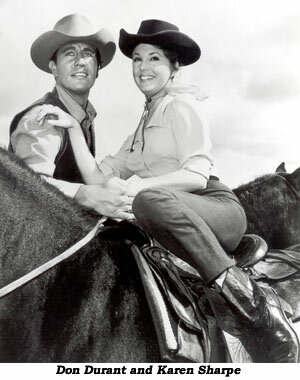 Do You Remember... "Johnny Ringo"
Four Star’s “Johnny Ringo” starring Don Durant aired only one season on CBS, 10/1/59 to 6/30/60 (38 episodes) on Thursday nights from 8:30-9pm ET, but is fondly remembered by TV western fans. A pilot for the series, “Man Alone”, actually aired March 5, 1959, on “Zane Grey Theatre”. When the show went to series all but an opening scene with Durant and Roy Barcroft was recast and reshot, although the scripts are the same. Ringo carried a Le Mat Special, a custom made six shooter with a separate cylinder that fired a shotgun shell, sometimes referred to as his “seven shooter”. Although a terrific western under producer Aaron Spelling, the series faced stiff competition from “Staccato” on NBC and the very popular “Real McCoys” on ABC. Karen Sharpe gave up acting in ‘66 to marry producer/director Stanley Kramer. She and Durant reunited for the first time in years at Jim Roberts' ‘96 Pre-Golden Boot party. Goddard went on to co-star in “The Detectives” and “General Hospital” and is today a teacher. London born DeMarney died in ‘71 of an accidental subway fall.